In December, the Scottish Government published its new Planning Bill. This briefing note provides a summary of the main changes contained in the Bill. Further details of these changes can be discussed with John at PPD – contact details at end. The Scottish Parliament’s Local Government and Communities Committee has launched a call for organisations and individuals to submit written evidence setting out their views on the Bill. Those views will then inform the Committee’s scrutiny of the Bill. The closing date for receipt of submissions is 2 February 2018. Strategic Development Plans will be abolished. the NPF will become part of the ‘Statutory Development Plan’ (along with the ‘local development plans’). “Gate-checking” of the proposed plan by a Scottish Government Reporter: the planning authority have to prepare an “Evidence Report” which must be approved by the Reporter before the Plan can proceed. councils will no longer be able to ‘adopt’ supplementary guidance. “Local Place Plans” will be introduced by which a community can make its own plan. the Local Development Plan will require to have regard to any existing Local Place Plans. the power will be introduced for the Government to make Regulations specifying the circumstances in which PAC is not required. “Prior notification” of permitted development rights. the ‘default’ period will be 3 years for a detailed permission and 5 years for a PPP but longer or shorter period may be imposed by the planning authority. Flexibility will be introduced to allow a planning authority to ‘part-grant’ or ‘modify’ an application –subject to applicant agreement. Significant increases to maximum fines available for non-compliance with various enforcement notices, and unpaid direct action costs can be imposed on land titles. Mandatory training of Councillors involved in LRBs, and annual planning performance reports. Planning authorities to charge full or reduced fees or waive fees, within parameters established by the Scottish Ministers. Scottish Ministers will be able to charge fees for the discharge of their functions. (fees for planning appeals?). The levy would capture a proportion of land value enhancement to fund investment in infrastructure. it would be payable to and spent by the local authority in whose area the development takes place, but with potential for pooling of contributions from across the local authority area or at a regional level. the Bill provides power for Scottish Ministers to make regulations detailing matters such as how a levy will be calculated, who will be liable, collection, aggregation and spending of contributions and rights of appeal. the Bill does not in itself require that an infrastructure levy be introduced, as the Government states that further work and consultation is necessary on the subject. schemes are made by planning authorities, and a consultation process is required. 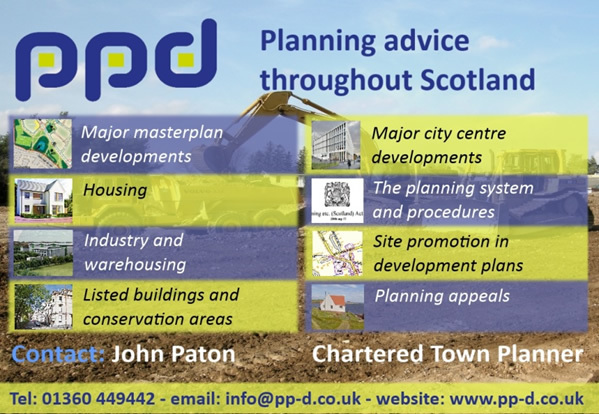 Only eight and a half years since the last major upheaval in the Scottish planning system, another is looming. The Bill’s content will not come as a surprise, as our previous client briefings have described the review commissioned by the Government, and the consultation document “Places, people and planning”. The substantive changes are in Development Planning, with a fundamental change in the way the system works. we applaud attempts to streamline LDPs and do not bemoan the demise of Main Issues Reports. However we are concerned that the ‘gatecheck’ could reduce the opportunity for thorough examination of plans. The devil will be in the detail. We expect that councils will still wish to carry out some form of pre-plan consultation such as the “call for sites” carried out by most councils. ten year duration for plans seems long: we expect that a range of issues will need to be reviewed within that period. On the other hand some councils have barely managed to produce their existing Local Development Plans in ten years! we will be interested to see Local Place Plans as they emerge. The cynical assumption is that they will be used by groups within certain communities to prevent development. Changes to the Development Management system are less significant. Expansion of delegation is something that was inevitable, but we are completely opposed to Certificates of Lawfulness being brought within the delegated system. Taking decisions on these applications requires technical analysis of planning evidence and a full understanding of legislation and case law, and appeals require professional judgement, rather than the local political issues or expediency that often underlie Local Review Board decisions. Training of Local Review Board councillors is a meaningless sop. the provisions relating to fees are vague and are to be left to regulations. We have recent experience of a planning authority taking an ad-hoc decision to ignore the Fees Regulations and charge much higher fees – we would be concerned if this became legally possible. Again, the devil will be in the detail. Some sort of Infrastructure levy was inevitable, given the financial constraints on local authorities. This subject was brought into sharp focus last year by the Aberdeen City and Shire Strategic Development Planning Authority v Elsick Development Company Limited case. We assume that there will be a mechanism which will allow planning authorities to avoid the “must be directly related to the development” requirement of the present Section 75 agreements. The Bill does not go into detail: it proposes enabling legislation. The devil – yet again – will be in the detail. Us older folk who have been kicking around the planning game for too long will remember the old Enterprise Zones, most of which comprised a Development Order granting planning permission for almost anything. Such a laissez-faire approach would be completely politically incorrect nowadays (though very few major horrors resulted in the EZs). We will be interested to see firstly if any planning authorities are prepared to forego their powers of control to speed up economic development, and then how radical they will be in removing planning controls. We aren’t holding our breath!